Like its predecessor Signature in the Cell, this latest book by Stephen C. Meyer began to generate hostile criticism before it even appeared in print. Anything that challenges the Darwinian paradigm in biology stirs a strong response, and much of it has not dealt with the science issues but has produced harsh ad hominem attacks on the author (attacks which would be roundly condemned in other circles, but seem to be okay when evolutionary theory is challenged). Mr. Meyer focuses on the scientific issues surrounding an event known as the “Cambrian explosion”—geologists, evolutionary biologists, and other scientists date this event some 530 million years ago. Over a relatively brief period of time (some 5–10 million years), the complexity of life literally exploded. Prior to this time, evidence suggests that only one-celled organisms and those very simple organisms (such as sponges) were in existence. Then suddenly (in evolutionary time frames), much more complex life forms came on the scene. The time frame for development of these new creatures is much, much less than expected if the complexity has occurred gradually. In order to form a new and more complex organism, new information is needed. This genetic information (basically involving DNA but also using some intricate control processes) had to develop in order for the new organism to come into existence. The development of this new information and the driving forces for organization of the material needed for the new organisms cannot be explained by modern evolutionary thinking. The arguments brought out in Darwin’s Doubt are extremely complicated and cannot be covered adequately in a short review. Where Mr. Meyer parts company with mainstream evolutionary thinking is in his ideas about how the complexity we see in organisms developed. It is obvious by now that this complexity cannot arise randomly—a simple structure cannot spontaneously give rise to a more complex structure. Mr. Meyer suggests that this complexity arose due to an intelligent cause, not from an undirected natural process. This idea of intelligent design is anathema to those who permit only purely naturalistic explanations to be considered in science. Intelligent design (ID) is often equated with creationism. In fact, many critics of ID show their lack of understanding by using such terms as “intelligent design creationism” and “stealth creationism” in their comments about intelligent design. Creationism is a concept that derives from a literal interpretation of the Bible. Intelligent design is based on our knowledge of science and of the complexity of modern biological and biochemical processes. Intelligent design advocates are often Christian, but are also Jewish, Muslim, agnostic, and atheist. There is nothing in ID theory that makes any attempt to define the source of the complexity. The book is extremely well documented. There are over 26 pages (in small print) of citations to the scientific literature. Journal articles come from such well-known publications as Science, Proceedings of the National Academy of Sciences, Annual Review of Genetics, Nature, Evolution, and other mainstream research journals. Mr. Meyer does not shy away from considering what his critics have to say. Numerous citations that defend evolutionary concepts are provided. The material in this book is very well balanced. 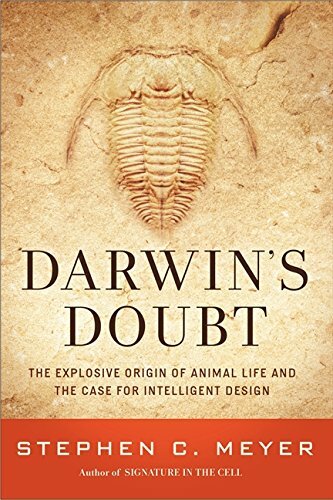 Darwin’s Doubt will give rise to heated discussion and debate. A day after its release, we are seeing attacks on the book and the author (with some evidence to suggest that its most severe critics have not read the book). It joins several recent books that challenge classic evolutionary thinking by exploring the science involved and assessing the shortcomings of the theory. The book is an indispensable tool for anyone wanting to understand the facts of the current controversies in evolutionary thinking.